Sarychev Volcano is located on the northwestern end of Matua Island, which is part of the Kuril Islands, a chain of 56 islands northeast of Japan. The eruption sent a plume of brown-colored ash and white steam rising into the atmosphere. The plume was so immense that it cast a large shadow on the island. Sarychev is one of the most active volcanoes in the Kuril Island chain. Prior to June 12, the last explosive eruption occurred in 1989, with eruptions in 1986, 1976, 1954, and 1946 also producing lava flows. Watch the video to see how the eruption looked from space. A fortuitous orbit of the International Space Station allowed the astronauts this striking view of Sarychev Volcano (Kuril Islands, northeast of Japan) in an early stage of eruption on June 12, 2009. Sarychev Peak is one of the most active volcanoes in the Kuril Island chain, and it is located on the northwestern end of Matua Island. Sarychev Peak is a stratovolcano covering almost the entirety of Matua Island in the Kuril Islands, Russia. It is a young, highly symmetrical stratovolcanic cone. Stratovolcanos (also known as composite volcanos) are conical volcanos built up by many layers (strata) of hardened lava, tephra, pumice, and ash. Unlike shield volcanoes (a type of volcano usually composed almost entirely of fluid lava flows, shield volcanos have low profiles like an ancient warrior’s shield – hence the name), stratovolcanoes are characterized by a steep profile with a summit crater and periodic intervals of explosive eruptions and effusive eruptions, although some have collapsed summit craters called calderas. Sarychev erupted June 11-21, 2009, sending out ash plumes. As the volcano is near some of the main air routes between East Asia and North America, there was some disruption to air traffic. During an early stage of the eruption, on June 12, 2009, the International Space Station passed overhead and astronauts were able to photograph the event. A hole in the overhead clouds, possibly caused by the shock wave from the explosion, allowing a clear view of the plume and pyroclastic flow down the sides of the mountain. In the video above, the plume appears to be a combination of brown ash and white steam. The vigorously rising plume gives the steam a bubble-like appearance; the surrounding atmosphere has been shoved up by the shock wave of the eruption as explained above. 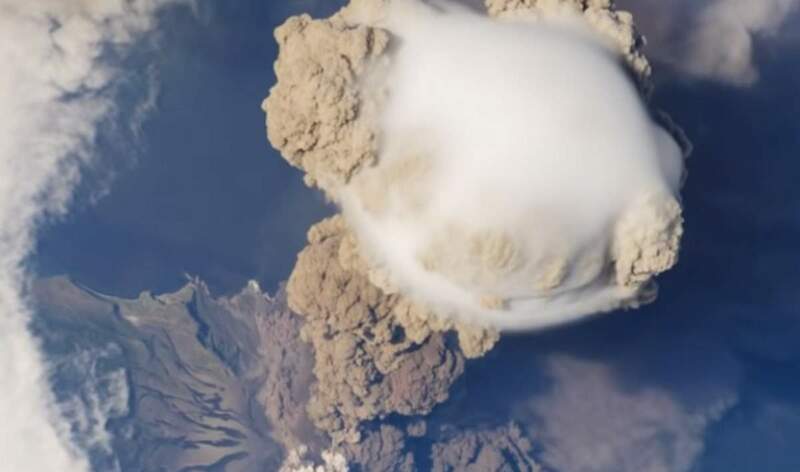 The smooth white cloud on top may be water condensation that resulted from rapid rising and cooling of the air mass above the ash column and is probably a transient feature (the eruption plume is starting to punch through). The structure also indicates that little to no shearing winds were present at the time to disrupt the plume. By contrast, a cloud of denser, gray ash – most probably a pyroclastic flow – appears to be hugging the ground, descending from the volcano summit. The rising eruption plume casts a shadow to the northwest of the island (bottom center). Brown ash at a lower altitude of the atmosphere spreads out above the ground at upper right. Low-level stratus clouds approach Matua Island from the east, wrapping around the lower slopes of the volcano. Only about 1.5 kilometers of the coastline of Matua Island (upper center) can be seen beneath the clouds and ash. Sarychev Peak volcano previously erupted in 1760, 1805, 1879, 1923, 1927, 1928, 1930, 1932, 1946, 1954, 1960, 1965, 1976, 1986 and 1989.